If you’re a senior or live with limited mobility and have a minimalist, basic walker you might miss out on the advantages of a rollator. A rollator, or rolling walker, can offer seniors more natural movement, more nimble maneuvering, and an easier time covering outdoor terrain. Whether you are researching rolling walkers with seats, walkers with seats and brakes, or heavy duty rolling walkers, we’ve sorted through some of the best. Read on and uncover our top ten picks of these beneficial mobility aids. We love this walker for its versatile use indoors or out, fold-up seat, basket, and most of all, its price. You get to select from two color options. Over 1,000 answered product questions available. Hand brakes for quick stops. Padded seat with backrest adds comfort. Returns/warranty issues for some users. Not ideal for taller or larger seniors. The Drive Medical Four Wheel Walker Rollator with Fold Up Removable Back Support is an incredible value for the overall features this mobility aid offers. This rolling walking has a backrest and a removable or foldable, padded seat, and a basket for carrying items with you. Its affordable price makes it even more attractive. We like the sturdy steel frame it offers and the choice of two colors (blue or black), as well as the hand brakes for quick stops. This walker/rollator has durable castors for either indoor or outdoor use. That makes it ideal for elderly who want to get outside now and then even with a rollator. As an overall rolling walker, this is our favorite for the combination of design, features, and an unbeatable price. We like the high-quality of this rolling walker and the extremely compact folding design. 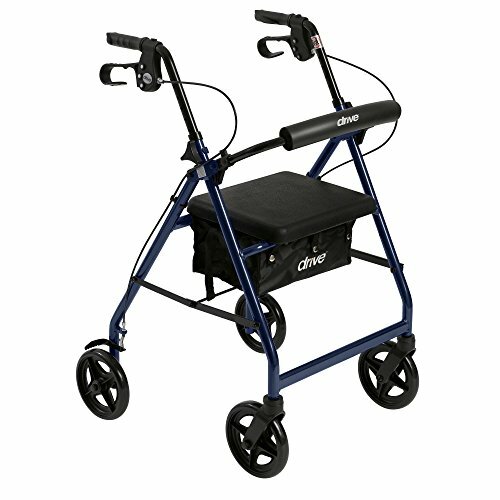 4 wheels of 8 inch rollator, provides reliable support when walking indoors or outdoors, 300 pound weight capacity. Stability - ELENKER rolling walker with seat, the seat height is 20 inches from the floor. Compact size - Pull up the rope in the middle of the cushion, with one hand by pulling seat grip up to folding. Perfect - Extra Large 8 inch wheels give you reliable stability for more confidence and with a removable storage bag for secure. Dual brake system for safety. Durable steel frame adds peace of mind. Some complaints regarding lack of customer service. The ELENKER Medical Rollator Walker not only fold in half but folds down again for an extremely compact design that fits comfortably in the trunk of a car. 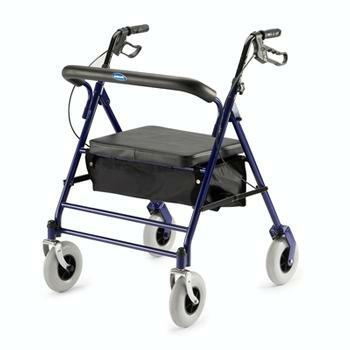 With lumbar back support and a sturdy steel frame, this is a fantastic rolling walker for those who want to get out but also need a durable, reliable device. We like this option for seniors who occasionally go out for meals with family or caregivers. It costs a bit more than some comparable models, however, it has a dual braking system for added safety and has an adjustable handle height that can go up or down four inches. It also comes in two color options (red or black). We love the sturdy castor wheels and easy foldability of this rolling walker. This is our favorite for those who want the benefits of wheels, but the security of standard-leg walkers. Only two front castors for more control. Lightweight aluminum frame is easy to lift. Flip-up seat moves out of your way. Flexible, durable fabric lumbar rest. Less stable than some models. No back castors make it hard to maneuver. Limited stride clearance with seat down. The Drive Medical Clever-Lite LS Rollator Walker with Seat and Push Down Brakes is an excellent mid-range priced walker for those who want a lighter-weight device. This is a half-rolling walker. With only two wheels in the front, you need to be able to maneuver a walker that requires to rear legs to be lifted while the front castors roll. 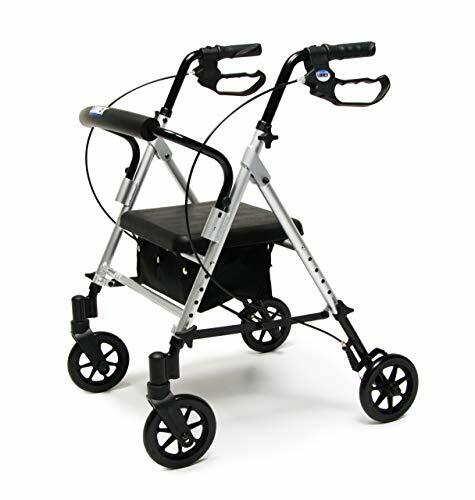 However, this can be an ideal choice for those who want to lift and “step” their walker a bit, but also want the added agility of front wheels. This lightweight walker has a flip-up seat and a convenient carrying handle. At under seven pounds, it’s easy for most individuals to lift. This walker also features push-down hand brakes and a durable, thick fabric lumbar support that molds to the user’s back. 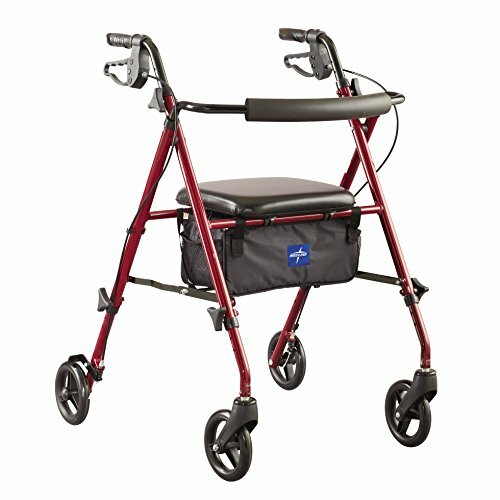 This is an excellent rolling walker for seniors who want that rolling assist yet want the safety of the non-wheeled rear legs. Sitting down to rest here and there and not having to worry that your walker is going to keep moving is a massive benefit of this two-wheeled model. 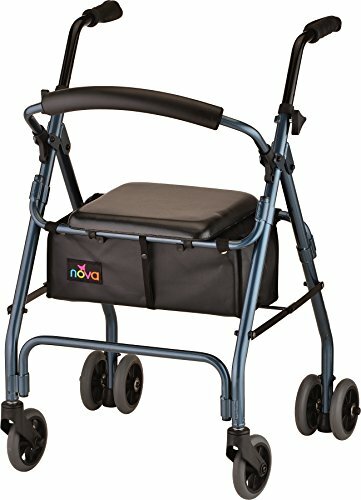 We like the NOVA brand for senior mobility devices, and this is an excellent standard rolling walker. Padded, flip-up seat moves out of your way. Storage pouch under seat for convenience. Padded lumbar support bar for sitting. Dual rear castors for stability. Some seniors may have trouble controlling. The NOVA Cruiser Classic Rollator Walker is an excellent classic rollator walker for those who need moderate-to-light support. It has an automatic weight brake (but does not have locking brakes). With doubled five-inch rear castors, and single five-inch front castors, it’s suitable for both indoor and outdoor use—we just do not recommend it on sloped or hilly areas because of the lack of locking brakes. This rollator weighs only 12 pounds, which is much lighter than some competitors. So, if you’re elderly and have trouble lifting heavier walkers, this could be a fantastic option for you. We especially like that under the padded seat you have a storage pouch, rather than a basket, keeping your items from falling through basket wires and offering more privacy. Overall, we love this option for the elderly who have a harder time lifting heavy items and perhaps need to carry items such as water or medications with them. We love the convenience of an ample carrying basket and the comfortable cushioned seat. 17.5" between handles; 22" seat height; height min./max. is 32.5"-37.5"
Features large basket under seat. Large 8-inch wheels add stability on bumps. On the heavier side, device weighs 17 pounds. Some user report of front wheels issues. The Medline Aluminum Folding Rollator Walker offers a sturdy, quality design and large wheels that make it ideal for indoor and outdoor use. The eight-inch castors wheels handle terrain outside a bit easier than smaller wheeled models. The padded seat is comfortable and has a convenient, ample-size basket underneath. This is excellent for seniors who need a sturdy rollator walker and also need to the handiness of a basket for personal items or even for small oxygen tanks to move with your walker. This rollator walker with a basket comes in an attractive blue color, and also had a padded lumbar support bar for moments when seniors or those with limited mobility need to rest. If you don’t need to do a lot of lifting of your rolling walker and need a durable model with a way to carry items, this is our favorite with a basket. The fantastic price and safety of loop locks and hand brakes made this our selection for a rolling walker with brakes. Loop locks and hand brakes for safety. Folds for storage or travel. Available in your pick of red or blue. The Drive Medical Four Wheel Rollator is designed with large 7.5-inch, non-marking casters. 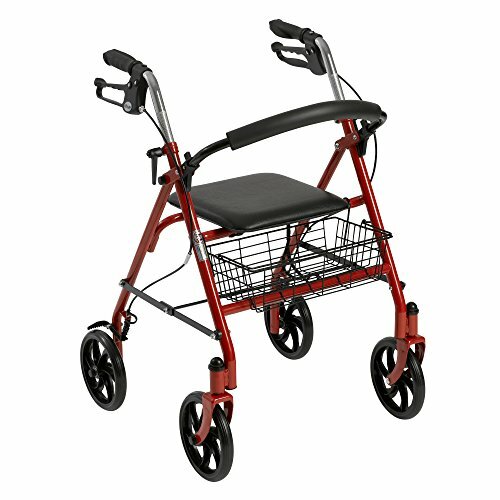 This is excellent for seniors who want to use their walker inside without damaging floors, but also want the mobility to get outside and have stability on the varied terrain of sidewalks and more. It comes with a removable basket for personal items such as reading glasses, small oxygen tanks, or anything else you need with you but can’t fit in a pocket. 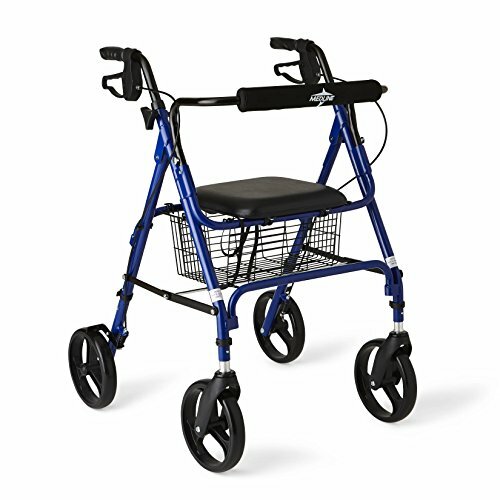 This rolling walking comes with hand brakes on both handles and loop locks for safety. We like the handbrakes for those who have trouble bending or have limited mobility to work pedal brakes. So, for elderly who struggle to step firmly and apply pressure to a brake, this handbrake model is ideal. The construction is durable for those who need a stronger rollator walker. We like the stability of this model. Take note, it is a little on the heavier side at close to 20 pounds. However, if that is not an issue for your situation, the incredible price for such a quality rolling walker makes this our favorite with brakes. This is our pick for a super lightweight rolling walker that also folds for easy travel. Easy to lift at only 11 pounds. Folds for storage or car trunks. Padded seat and lumbar support bar. Might be too wide for narrow doorways. Reports of customer service issues. The Medline Freedom Mobility Lightweight Folding Aluminum Rollator Walker is a well-rated, versatile rolling walker for the elderly or those with limited mobility. The extremely lightweight and foldable design make this rollator ideal for those who like to get out of the house often and need a walker that maneuvers well and is easy to lift. We like that it has an adjustable seat height, which is not on option on all rolling walkers. Its weight capacity is a little less than some steel frame models. However, if you are lightweight or only require light assistance from your walker, this a fantastic option. We found it easy to handle, fold down and back upright again, and also love the straightforward, tool-free assembly. 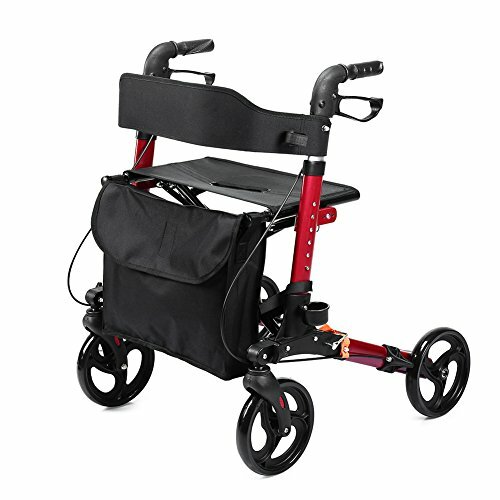 If you are aging in place but still want the option to get up and move around with a lightweight rolling walker, this version is an excellent option to consider. It has handbrakes for quick stops, comes in three colors, and also has a convenient pouch under the padded seat for carrying belongings. The easy-to-adjust seat height on this rollator makes it one of our favorites for those who frequently need changeable comfort needs. Front wheels rotate 360 degrees. Four color options to pick from. Not ideal for those over 6 feet tall. The Lumex Set N’ Go Adjustable Rollator is a mid-range priced rolling walker with the benefit of an adjustable seat. Being able to fine-tune the seat height on your rollator is ideal for seniors who struggle with leg issues, knee pain, or conditions such as arthritis that can make a specific height comfortable one day, but not necessarily the next. The seat adjusts in four one-inch increments, allowing for small adjustments or up to four full inches if you need the chair noticeably higher on a given day. This walker weighs 14 pounds—about the middle of the road for the weight of a rollator. It also has both locking and quick stop brakes for added safety. 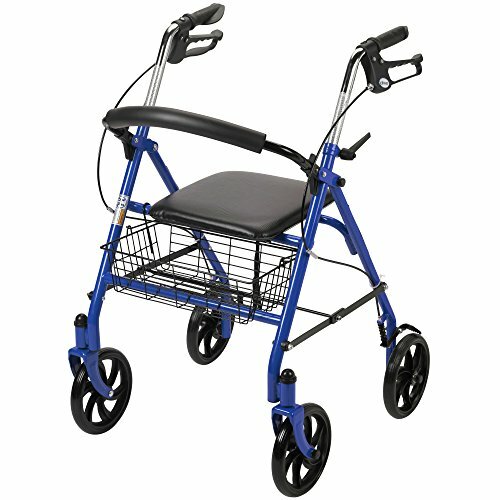 This rolling walker comes in four color finishes, has a padded lumbar support bar, and a storage pouch under the seat. We love this model for those who are not sure what seat height works best for them or need the ability to change their seat height regularly. The higher-than-average seat and adjustable handle height make this our favorite for taller seniors. Handles go as high as 38 inches. Slightly higher seat than average. Some complaints of legs/wheels breaking. Rare complaints of brake/brake cables failing. The Drive Medical Rollator Walker with Fold Up and Removable Back Support is ideal for the taller senior or tall individuals with limited mobility. The seat is slightly higher than average (it sits 23 inches from the floor, whereas many are 20 inches from the floor). It also has adjustable handles that move up to 38 inches—a decent height for most taller people. This rolling walker has a handy storage pouch to carrying personal items more privately than a basket. This rollator comes in a deep, sophisticated shade of both blue or red—ideal particularly for aging men who don’t want flashy, bright colors. Regardless of whether you a man or woman, though, if you’re elderly or have a physical disability and you need a rolling walker specifically for taller people, we love this model. With outstanding durability, sturdy wheels, and high weight capacity, this is our pick for a heavy-duty rollator. Measures 19.5 inches x 1 inch in diameter. Measures 22 inches from the floor. Handles adjust 34 – 38 inches. Width between handles is 22 inches. Overall width is 27 inches. Robust weight capacity for safety. Explicitly designed for taller individuals. Includes basket to carry belongings. Thickly cushioned seat for comfort. Doesn’t fit easily in smaller trunks. The Invacare Value-Line Bariatric is recommended for individuals ranging in height from 5’8” to 6’5” and has a weight capacity of 500 pounds. So, if you’re tall or need an extremely robust, heavy-duty rolling walker, this is our favorite. The large 7.5-inch wheels are thicker and sturdier than many walkers, too. The durability and wide castors make this an ideal rolling walker for outdoor use on uneven terrain. This rollator has a durable steel frame, a two-inch thick padded cushion, and has a broader and deeper sized seat than your standard version. This rolling walker is 26 pounds, so it is on the heavier side. However, if you need a genuinely durable model, this rollator is a safe bet, with fantastic reviews and a limited five-year warranty. 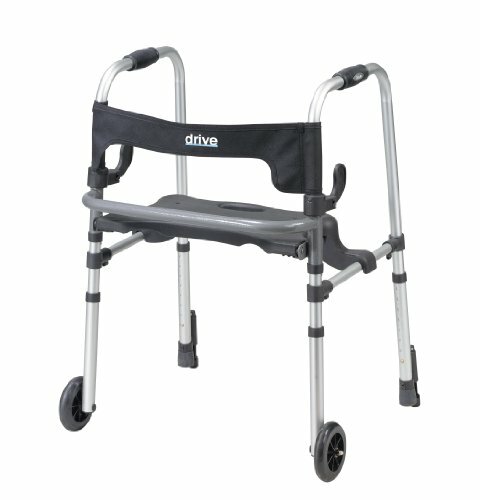 Invacare’s heavy duty rolling walker has quick stop hand brakes and also comes with a basket. So, if you need to carry personal belongings or a small oxygen tank, you can do so with ease. The padded lumbar support bar is helpful when seniors or those with limited mobility need to stop for a rest. Before you decide on a rolling walker, you’ll want to bear a few things in mind. Beyond just your budget, there are some crucial factors to consider when picking out a rollator. This is an essential device for senior safety, so it’s worth taking the time to review the following. The stability of your rolling walker is of utmost importance, considering this is what this particular mobility was designed for in the first place. Having a stable, durable device to assist your walking is vital. Stability in a rolling walker comes in a few forms, however. Beyond just strong bars to hold you up, you need to consider some added stability issues. With some rollators, you will only have the option of “quick stop” brakes. These will allow you to pause as long as you hold the hand brakes but will release as soon as you let up. If you want the option of fully braking the rolling mechanism, look for locking brakes, flip-down pedal brakes, or consider the two-wheel model. While all but one of the options we’ve listed have four wheels, that two-wheel model is worth considering if you are more concerned about being able to fully brake and stability, rather than maneuverability. Keep in mind, the more stable your rolling walker is, generally means the less maneuverable it will be. However, this is ideal for some seniors. It goes without saying that a walker should be able to hold you up without concerns of it breaking or getting wobbly. However, with rollators, you usually have the option of a seat to rest on when you need it. So, weight capacity can be even more of an issue with these types of walkers. If you’re concerned at all about a rollator being able to hold you up, look for a steel frame and avoid the lighter aluminum models. For heavier individuals, a bariatric version or the heavy duty favorite we listed is an excellent choice. If you need to carry items such as a small oxygen tank with you, it’s smart to look for a rollator with a basket or storage pouch underneath. For oxygen tanks, a basket can be a fantastic choice because it’s easier to see the levels of your tank at a glance, rather than removing the tank from an enclosed storage pouch. However, if items such as medications are something you need to bring with you, a pouch can be a better option, as you don’t have to worry about small bottles falling through the wires of a basket and the bags will afford you more privacy with your medicine. Be sure to contemplate precisely what kind of use your rollator will get before your purchase one. Measure doorways you’ll need to get through and compare that with the width of any model you look at. Think about whether you’ll need your rolling walker to fold down to fit in a car or for storage. That won’t be necessary for some people. Likewise, consider how often you might take it outside and how that will affect your braking needs and the size and type of wheels you want. With these 10 excellent options, there is bound to be a rollator that works well for you.